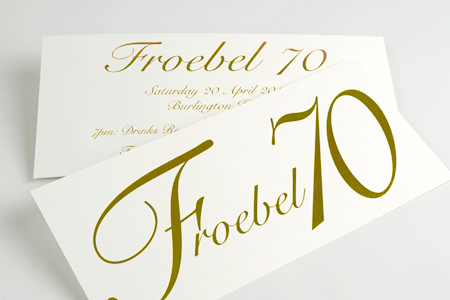 This year sees the 70th anniversary of the founding of Froebel College of Education, and coincides with their move from the Dominican College in Blackrock to the NUI Maynooth campus in September. We were delighted to be asked to produce the invitation for this event. Being such a special occasion the invitations were gold foiled on both sides onto a linen textured board and supplied with matching linen envelopes. We hope the dinner will be a great occasion and we wish every success in the future to all our friends at Froebel College.